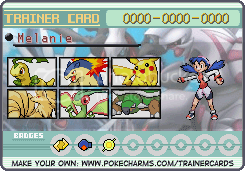 When I saw Sneasel on my game it became my favorite, and it still is today. Jolteon. An electric dog is pretty flippin' sweet. Obviously, now it's Espeon. I can't remember if it was my first favorite, but when I was younger I loved Ninetales. I still do, just not as much. Charmander. I always liked it but it's been moved down in the ranks since I got older. Nowdays I prefer Ninetales but it is somewhere in my Top Twenty favorite Pokemon. Kyogre, and it's still in my permenate top three, right above Mudkip and Charmander. Like my avatar?PM me to request one like it! I always thought Lapras was awesome. I think it was Articuno. I used to love its glittery wings on Pokemon Stadium. xD I liked Ninetales, too. And Dragonair. When I got my Gold version, I fell in love with Totodile, though. D: just... too cute. My first fave was Bulbasaur. I named it Bob. Wait a second, Ditto was my first favorite Pokemon. Mistook this for Favorite Pokemon right now or whatever. I think. Victreebel also happens to be my current favorite. Also, I have heard that the Cake is The Truth. I've grown up now and moved on to Ivysaur. I think it was Mew. I was obsessed with the thing for a long time. I still like it, but not as much. Then I fell in love with Totodile and Cyndaquil. I think my first real favorite might of been Charmander.